Much needed after a hot day in D.C. yesterday. Wish I had enough money to put up some of these myself. Keep up the good work, Trevor!!!! 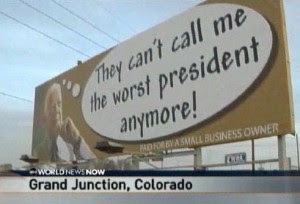 Er I have never heard of anyone referring to Carter as being a worse president than Bush. You people do realise that the rest of the world thinks Bush is not only the worst president of the US, but the worst president of any western country, ever....like past and future ever. Apparently Tammy wasn't trying to raise a family during the Carter years when interest rates went to 15%, unemployment was high and inflation was through the roof. If she had, she would know Carter was the worst president until this one. On the international scene, he helped the current Iranian regime take power and was impotent in getting our hostages released. Obama is on his way to exceeding Carter. Just wait and see.